Dental Implants or Tooth-Supported Fixed Bridge? 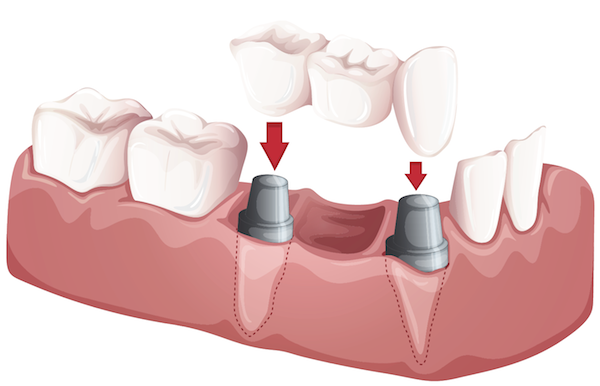 With dental implants you don’t sacrifice the integrity of adjacent healthy teeth to bridge the space of a missing tooth. A tooth-supported fixed bridge requires shaving down the adjacent healthy teeth and cementing the bridge. This results in weaker tooth structure and susceptibility to tooth decay. Dental plaque may build up beneath the crowns resulting in gum disease and bone loss. Tooth decay leads to root canals and tooth loss. A tooth-supported fixed bridge only lasts five to ten years and eventually it will need to be replaced. With a bridge there is no replacement for the missing tooth roots, the bone beneath the bridge will continue to shrink. Dental implants may need periodic adjustments. However, they can last a ‘lifetime’ with good oral hygiene and regular visits to the dentist for x-rays and clinical exams. Dr. Doug Sinn has extensive experience in oral and maxillofacial surgery and specializes in dental implants.